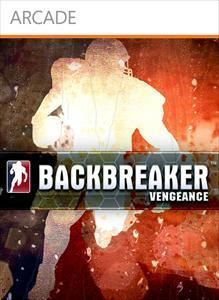 Backbreaker Vengeance is the sequel to Backbreaker, a full retail title that released a couple of years ago. This version of the game strips out virtually everything from the original title and only includes the Tackle Alley mode from the other game. Tackle Alley is the first mode you’ll come across in the game and it is by far the most fun. You play as the ball carrier and must avoid waves of tacklers. By either spinning or juking in time, the tacklers will miss and you can keep running to your goal: the endzone. Eventually, the tacklers glow with color coded outlines with some being yellow, others blue, and a few red. 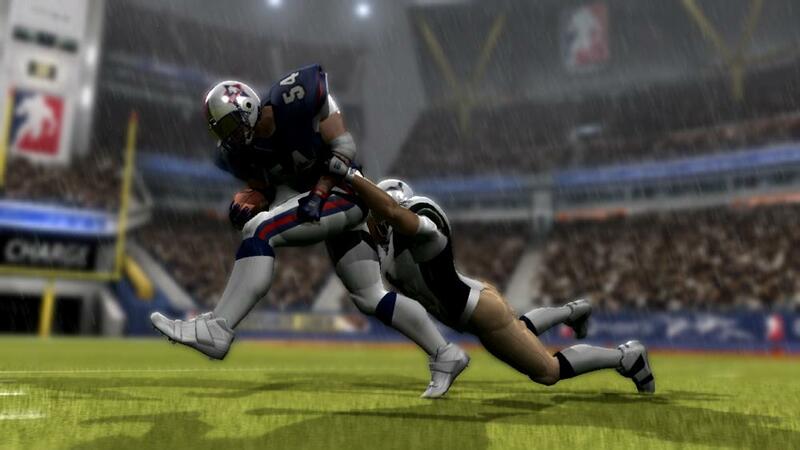 For yellow tacklers, you can choose to slide under them for a double point boost and slow motion gameplay. Spinning or juking is faster and safer, but the risk/reward of the special avoidance maneuvers are compelling. Red and blue tacklers are handled in different ways. At first it is fairly simple to rush through the waves. Eventually though, all the different tacklers start to be thrown at the player in the same wave and it is challenging. Once you get into the flow of it, it is a very addicting experience. However, learning the timing can be hard and the players themselves handle like tanks. That is, they are extremely clumsy and even at slow speeds, it takes so much time to turn, it is basically impossible to do so. Even once turned though, most of the time it is pointless as the tacklers are already on top of you. This basically requires you to only go straight ahead and use your avoidance techniques. The second game mode is called Vengeance. In this mode, you play as the tackler for some well deserved revenge. Ball carriers run to the endzone and it is your job to stop them. They will have defenders protecting them too. All in all, it is a different experience from Tackle Alley since it is your goal to stop a moving target, but in the end, it does feel so similar to the gameplay in Tackle Alley that it basically washes together into a very similar experience. The movement problems and clumsiness of the players becomes even more acute in this game mode though, considering how much harder it is to hit a moving goal like a player than a stationary goal like the endzone. The final mode is called Supremacy. In this mode, the goal is to outrun 2 other football carriers to the endzone while jumping over obstacles and avoiding a lone tackler. If you receive the lowest score in this mode, you will become the tackler. This mode is quite fun and hard, especially once you get into the strategy of it. Playing this mode online is also a great joy. Speaking of online though, it should be noted that matchmaking is quite slow and there were not thousands of people playing online. The online modes such as Tackle Alley are also much more difficult with two people as it a lot more chaotic. Nevertheless, playing with real people always substantially changes the gameplay components. Overall the game has its moments of glory. However, once you get right down to it, most of the time it turns into a very tough arcade sports game with color coded quick time events and, eventually, very repetitive game mechanics. To top it off though, the entire experience is shrouded in an unpolished package. For example, there is only a very limited feature set and the user interface is frustrating, to say the least. Take for instance, the replay system. There is an extremely minimalist interface implemented in the replay system and there is not even a slow motion button to press. Saving replays is also not allowed. Considering the implementation of the Euphoria engine, where all physics are supposed to be handled in a realistic, one of kind manner, the lack of such basic replay abilities is criminal. Its a shame too, because the Euphoria engine is awesome and I hope it continues to be used in many more games as its abilities in games are currently underused. 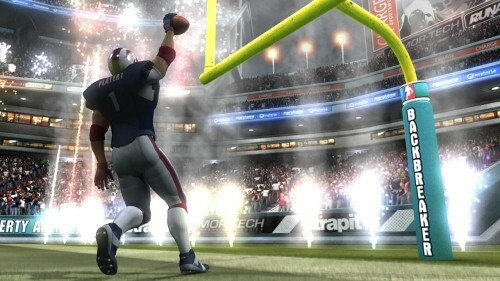 In conclusion, the arcade football experience is very entertaining and a nice break from realistic sports games. The achievements in this game are also nicely balanced and good for a quick boost in gamerscore. In short though, there are some very repetitive elements to the game and the annoyances in the game’s UI are frustrating enough to make this game an exercise in frustration. Not to mention the fact that the lack of polish makes this game seem like a seedy cash grab. For 1200 points, there are plenty of much better games. If this game goes on sale, then for sure buy it. For now though, only get it if your desperate enough for a different football game or in need of the all glorious gamerscore.